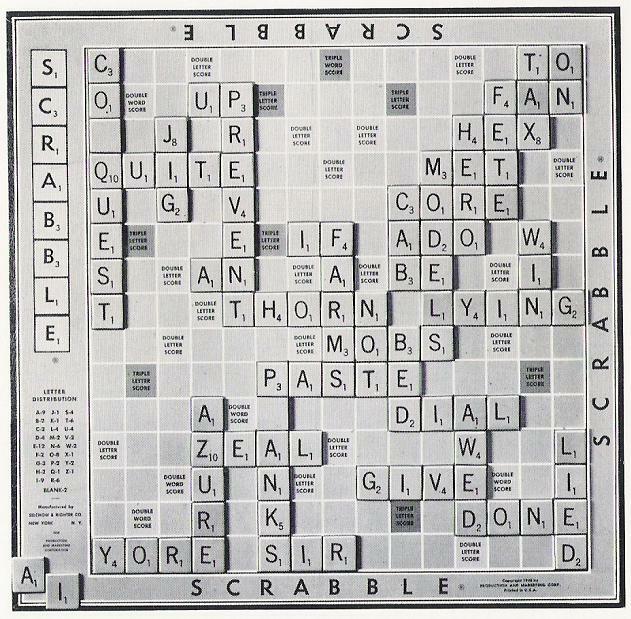 Scrabble; first Deluxe Scrabble set, 1953. 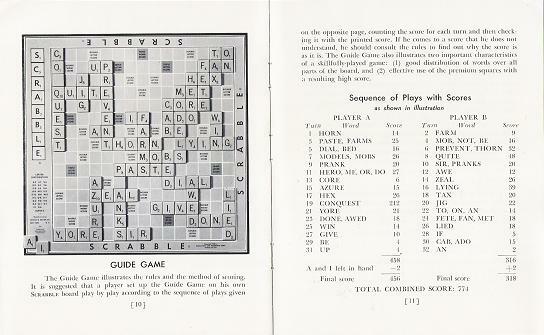 For the most part, this page provides a detailed description of the earliest Deluxe Scrabble set. 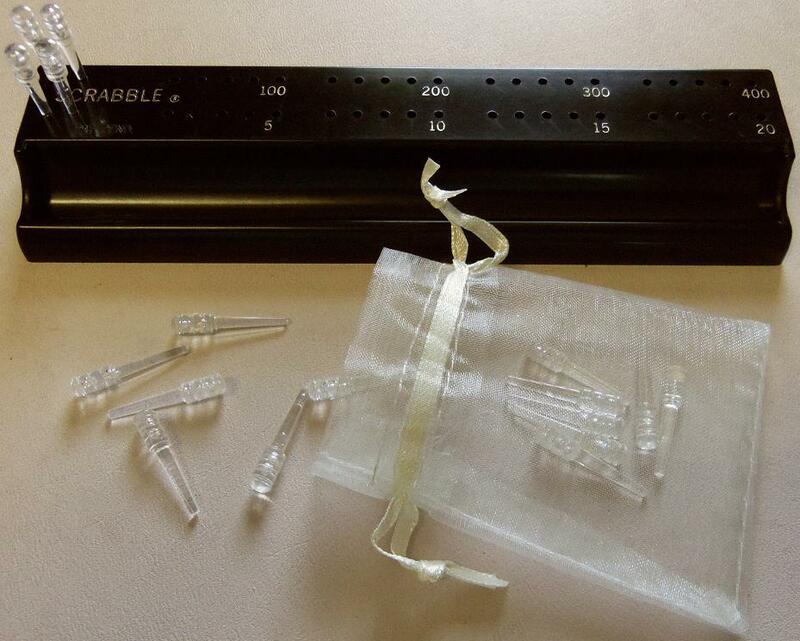 You might own one of these and not even be aware that it is a Deluxe Scrabble set. "Deluxe" is not trumpeted on the case, and the board doesn't turn or have a plastic grid to keep the tiles in place. Only in the instruction booklet do we find the word "deluxe" used a few times when they discuss the "Scoring Device for Deluxe Sets." 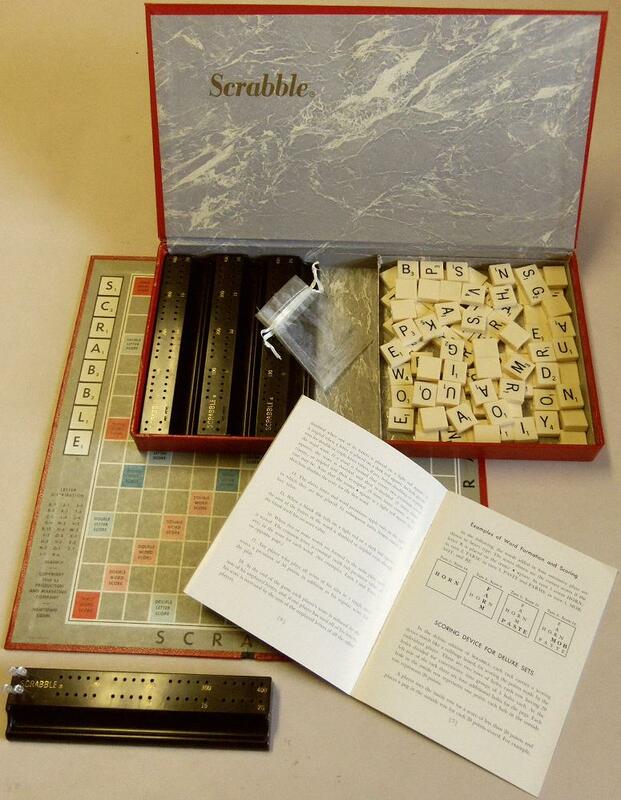 There is also a fun discussion of how we know that the particular set described here is one of the very first Deluxe Scrabble sets ever produced. Don't miss it. For the impatient, here's a link that takes you directly to THE FORTUITOUS GOOF section. We'll start with a little background . 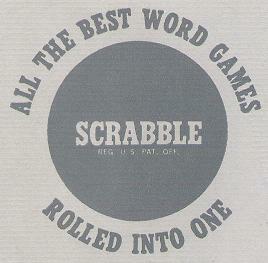 . .
Scrabble had had modest sales for its first few years, starting at the end of 1948. Things started to ramp up in mid-1952, and went totally out of control by early 1953. 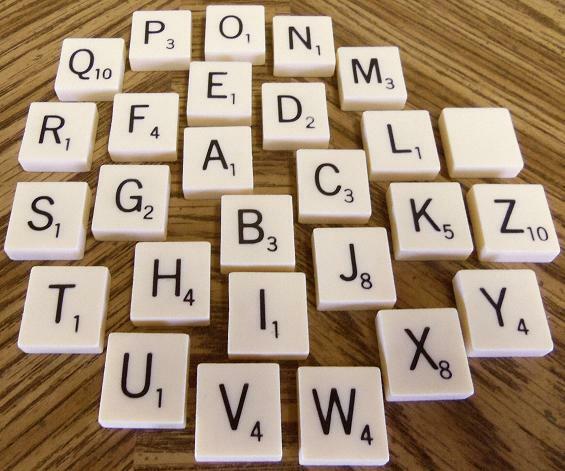 Scrabble's producer, James Brunot, could not hope to keep up with the orders, and he licensed production of the standard Scrabble set to the games company, Selchow & Righter. But Brunot had an eye towards a Deluxe Scrabble set, and retained that for himself. I can't say exactly when the first deluxe Scrabble sets produced by his "little business in the country" in Newtown, Connecticut, hit the stores, but we have some dates that help us narrow it down. The filing date for the patent on the deluxe scoring racks was September 9 1953, and the patent application states, "The trade-mark was first used on ... the scoring device on September 2, 1953 and was first used in commerce ... on September 3, 1953." Don't ask me what that means, exactly, beyond the Deluxe Scrabble scoring rack "coming out" in early September, 1953. Then, on October 28, 1953, we find a Macy's ad for Deluxe Scrabble in the New York Times (page 12). "$9.98 ... limited quantity ... buy now for Christmas ... to keep pace with the chi chi crowd ... "
So there's our window; Deluxe Scrabble appeared in stores somewhere between early September and late October 1953. The copyright date for the deluxe instruction booklet is October 12 1953, but whether that can be used to narrow down our window even further, I don't know. In June 2014 I snagged one of these earliest Deluxe Scrabble sets on eBay. I'll tell you later how I know it's from 1953, but first, let's just look it over. Here's the red case, sometimes described as "red leatherette", but looking and feeling for all the world like red plastic or vinyl. No matter; it's a charming bit of American history! Earliest Deluxe Scrabble set - red leatherette! And here are the treasures awaiting the "chi chi crowd" upon opening their $9.98 Scrabble set. Contents of earliest Deluxe Scrabble set. Basically, the differences between the $10 deluxe set and the $3 standard set were the heftier, plastic tiles, the scoring racks and pegs, and an instruction booklet. Here's the "interesting" corner of the deluxe board. If I understand correctly, though, Selchow & Righter actually made the deluxe game boards for Brunot, as they had been hired to make boards for the standard sets practically from the beginning. 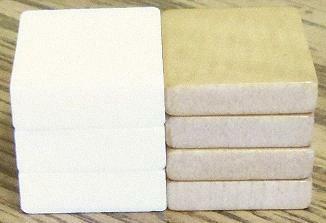 The deluxe tiles were made of plastic. While that may or may not sound particularly "chichi" to you, they could boast an advantage or two over the standard wood tiles. Dogs were less inclined to eat them, and, while they weren't "braille-proof", they did have uniform backs. 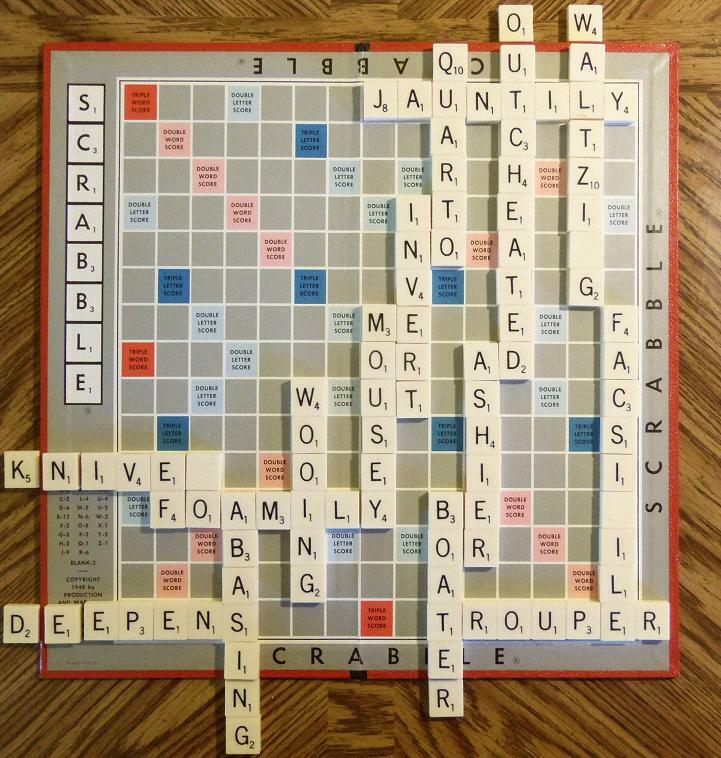 Remember that Scrabble players used to pick tiles from a face-down pool. Deluxe Scrabble tiles in a ballet. The plastic tiles are quite a bit thicker than the familiar wood tiles from the regular set. Here you can see that 3 deluxe tiles stack up a smidgen higher than 4 regular tiles. 3 deluxe tiles vs. 4 standard wood tiles. Here's a deluxe scoring rack with pegs at the ready. Scoring rack, scoring pegs, and dainty peg bag. Don't panic! I will teach you how to use the scoring rack further down. Here's the cover graphic for the deluxe instruction booklet. Here's title page of the instruction booklet (reduced). And here are the three sections of the title page, nice and legible. We finally see the word "Deluxe". The string of dates, "1948, 1949, 1953", correctly brings to mind the 1953 rules we are familiar with in the inner lid of the standard set (and which remained unchanged until 1976.) The 1953 deluxe set rules and the 1953 standard set rules are virtually identical. They only differ in how they direct the reader to the example Turns, since they're laid out differently. The most significant addition to the 1953 rules was one stating, "New words may be formed by ... placing a complete word parallel to a word already played so that adjoining letters also form complete words." Since none of the 1949 rules explicitly said you could do this, and none of the examples quite showed it, there must have been Scrabble players uncertain about it. To illustrate this, the rules in the standard set added a new example Turn 5 in which the complete word BIT is played under PASTE, forming PI and AT. Copyright dates indicate that the deluxe set actually led the way to the updated rules; the deluxe instruction booklet was copyrighted on October 12 1953, and the standard set rules were copyrighted 10 days later, on October 22 1953. So was example Turn 5 consciously passed over as being unnecessary for the deluxe rules because of the Guide Game, or was it not even thought of until they moved on to updating the rules in the standard set? This is all a lot more interesting than I'm making it sound. 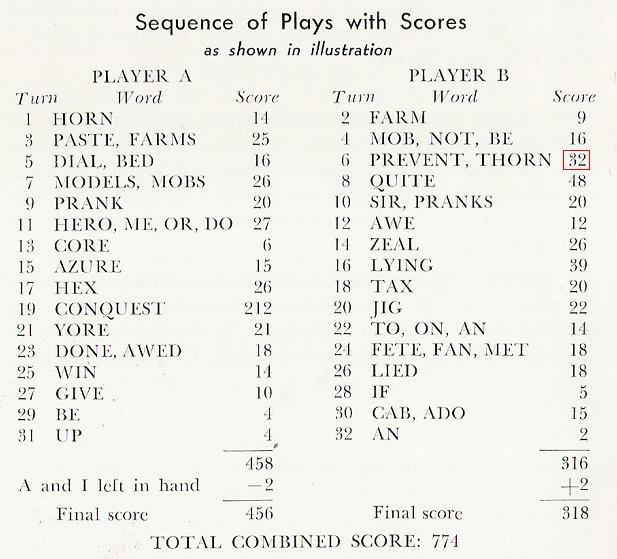 Speaking of the Guide Game, here is the spread of pages showing the Guide Game and the Sequence of Plays with Scores (reduced). And here are the three sections of those pages, nice and legible. And now we come to . . . 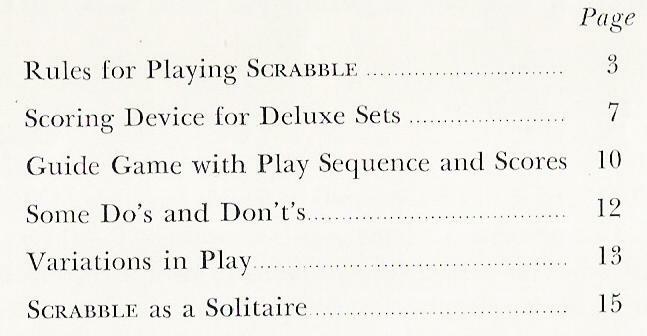 In the December 14 1953 LIFE magazine article, mentioned earlier, they reproduce the Guide Game and Sequence of Plays from the deluxe booklet in a breakout called "How To Play Scrabble". It's apparent that LIFE set up the Guide Game from scratch using standard wood tiles--their subscribers were the hoi polloi, not the "chichi crowd"! They also reset the type for the "Sequence of Plays with Scores". You could almost swear it was a cut-and-paste job, but note the different Q fonts in CONQUEST. And they gave names to Players A and B, "Smith" and "Jones", respectively. They were fastidious in reproducing everything in the deluxe booklet exactly . . . including the scoring mistake! Look at Turn 6. Player B/Jones deserved the bingo bonus of 50 points for playing PREVENT, using all 7 of his tiles. His score for the play should have been 82, not 32! Not enough to turn a loss into a victory, but it's the principle of the thing. A month later, LIFE (January 11 1954) printed three humorous letters from readers who caught the error. 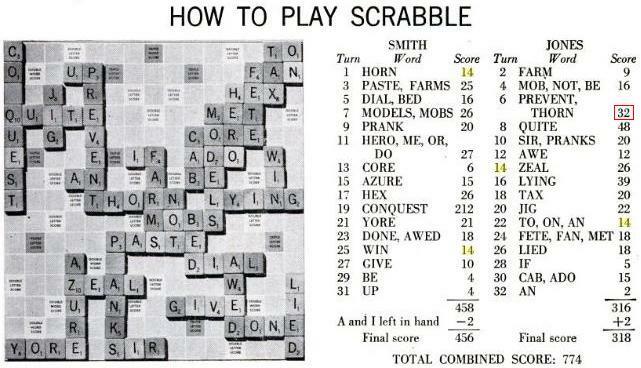 I feel sure Smith was keeping score on your hypothetical Scrabble game. [...] If I were Jones, I'd certainly never play with Smith (or LIFE) again. I doubt that Jones stands a chance of ever beating such slick-of-hand mathematics as that displayed by Smith. 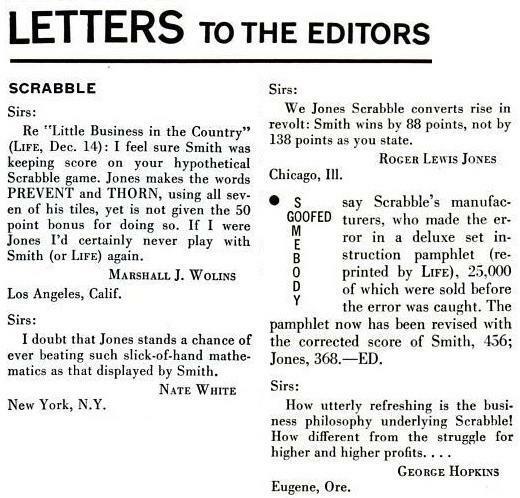 We Jones Scrabble converts rise in revolt: Smith wins by 88 points, not by 138 points as you state. The last from one Roger Lewis Jones. SOMEBODY GOOFED, say Scrabble's manufacturers, who made the error in a deluxe set instruction pamphlet (reprinted by LIFE), 25,000 of which were sold before the error was caught. The pamphlet has now been revised with the corrected score of Smith, 456; Jones, 368. So there you have it; an incorrect final score of 456 to 318 identifies your Deluxe Scrabble set as one of the original batch, turned out for the Christmas rush in latter 1953. As I write this in July 2014, I claim to be the only person on earth who has one and knows what he has! I wonder when and how Brunot was alerted to the error. Notice that the editor didn't give the credit to LIFE readers. I would suspect that some of Brunot's customers caught it first, perhaps weeks before the December 14 LIFE went to press. Sales of the deluxe set were already brisk when the article was in preparation. LIFE noted, "Brunot himself is mildly surprised that the $10 game sells as well as it does." But even supposing LIFE readers were the first to catch it, understand the chronology. The December 14 LIFE magazine would have been on newsstands (and in mailboxes, too, I believe) a week earlier, on December 7. Of the hundreds of thousands of Scrabble-playing LIFE readers, certainly a few of them, at least, would have devoured the Scrabble article and spotted the error within a few days, and some of those would have been eager to be the first to report the error to LIFE, or Scrabble directly. So don't fall into the trap of thinking the error was uncovered on or about January 11 1954, the cover date of the LIFE issue reporting the error. It would have been by early December 1953 at the very latest, and I'll bet you weeks earlier than that. There's an interesting figure given in the LIFE article: "By Christmas, Brunot's employes will have turned out 30,000 of the $10 games..." It's very shaky speculation, but if that means they printed up an initial batch of 30,000 instruction booklets, and 25,000 went out before the mistake was caught, then maybe there are 5,000 sets out there with hand-corrected scores on page 11? Now, class, we will learn how to use the deluxe scoring racks. It works in a kind of mixed Base 20/Base 10 system. The example is taken from one of the turns from my first game played on this set, shown further down. The holes in the top row step by 20. My score was at 168. The biggest multiple of 20 that fits in 168 is 160, and you see a peg at 160, the third hole after 100. The holes in the bottom row step by 1 up to 20. You see a peg at 8. Together, they indicate a score of 168. The spare pegs to the left will be used in stepping up to the next score. After boosting score by 180. After boosting score by 14 more. Did we get it right? Let's see, it looks like 362 on the rack. And, hey, 168 + 194 = 362; we got it! But don't ask me what's to prevent your opponent from helping himself to a few extra points (by the score!) with a bit of "accidental" peg placement. Besides being a lot more work than paper and pencil, there's no double-checking with the scoring racks! I mentioned at the top that the filing date for the patent on the scoring racks was September 9 1953. You can almost make out "PAT. PEND." stamped in the plastic below "SCRABBLE" in the photos above. Here is the first game I played on my deluxe set. In fact, it is a solitaire game of Scrabble III For BIG Word Lovers, which is three steps beyond "regular" Scrabble in the march on bigger, healthier words on the Scrabble board. 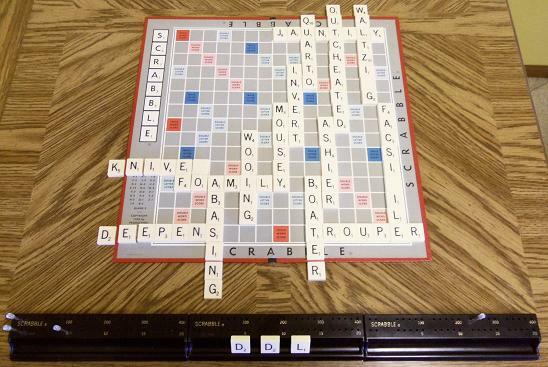 (See my pages devoted to Scrabble For Word Lovers.) Scrabble III demands that your main word be a BIG word (at least 6 letters) on every play! 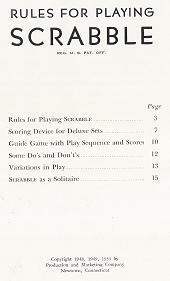 Scrabble III on the earliest deluxe Scrabble set. I was pleased with this game as an honestly played maiden voyage on my early deluxe set. I liked the one-two finale punch, FACSIMILE followed by WALTZING, just fitting in over on the right side when most of the left side had been in a fix almost from the beginning. As you see below, it took three scoring racks to hold my final score of 1044. Well, you couldn't have expected Mr. Brunot to consider everything that would come down the line! This page would not have been much without information supplied by Dayne, Scrabble historian extraordinaire. Dayne first showed up in my Scrabble Dating page. No, we have never played Scrabble by candlelight, or any other form of illumination; Dayne alerted me to her pre-registered trademark, round label, "1949" Scrabble set which obviously predated my "1949" set showing "REG. U.S. PAT. OFF." You may thank Dayne for tracking down Scrabble-related copyright, trademark, and patent information, and neat, old Scrabble ads.